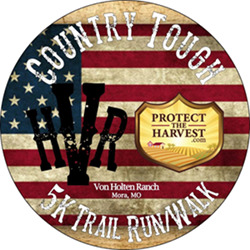 Country Tough 5K Trail Run/Walk will be held Saturday, March 2, 2019 at 9:00 a.m. at Von Holten Ranch, 30455 Pacific School Road, Mora, MO 65355. There will be a timer on-site. Entry fees are $25 for adults if paid before February 24 with a guaranteed t-shirt. The entry fee is $30 the day of the race. This is a fundraiser for PROTECT THE HARVEST.